The construction site: which projects are developing in the quarter? Where do you find everyday life in Europacity? A tour of Europacity today gives you a glimpse at the future of urban development around Berlin’s main train station – a future taking shape in different stages of construction. And yet many things are already there. A barren plot becomes part of the city, a wasteland is transformed into urbanity. The new quarter’s front row of buildings, soon to be complemented by other high-rises, are already now part of the skyline of the capital. 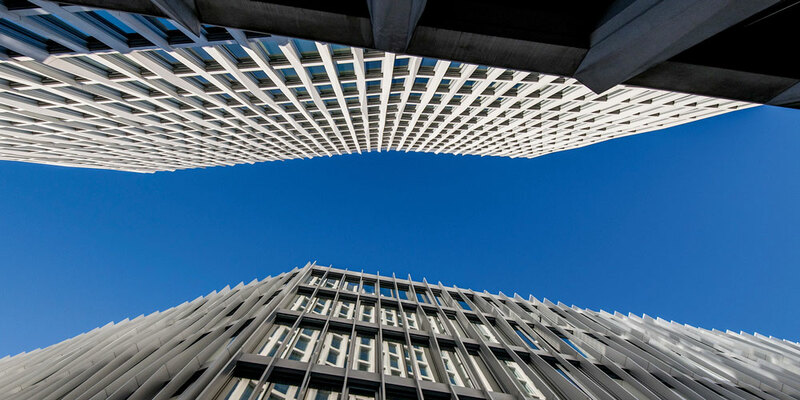 The TOUR TOTAL and 50Hertz buildings rise into the sky like landmarks, with impressive facades both very different in design. 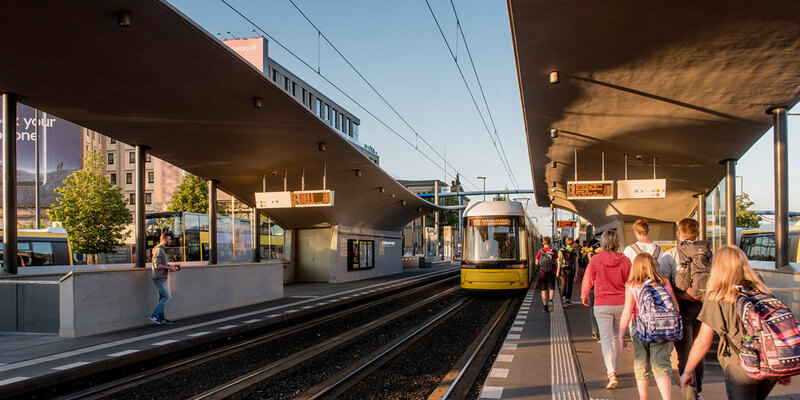 In between, people hurry about, heading to the train station or the new modern-looking tram stop. Visitors to the museum of contemporary art in the former Hamburger Bahnhof mingle with hotel guests from all over the world – as well as the numerous people who already work here. Around them, here and there, the sight of moving vans. Once you leave behind the hustle and bustle of Invalidenstrasse and Heidestrasse, and enter the quarter in an easterly direction, the picture suddenly changes. Here at KunstCampus, a beautiful square with lawns and birch trees has been created with pedestrian areas made from the original paving stones. 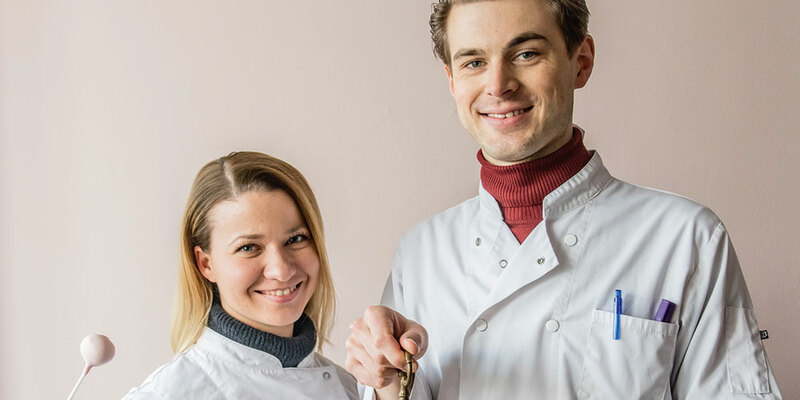 The first residents on the square have recently moved in, and for the benefit of the many office workers, the first restaurant has just opened directly on the Berlin-Spandau canal. the 50Hertz building, and also creative people from the architecture offices. They eat and meet in Reinhard Bär’s place, the restaurateur is friends with many of his guests, and the kitchen is probably the busiest place in the entire quarter between 12 and 2 pm. The restaurant has seating inside for 80 guests and just as many again in the outside area. By noon all the chairs have been taken. A few metres further north, the picture changes again. Cordoned off areas, piles of sand, bulldozers and transporters – and looking skywards, numerous cranes appear to be framing the TV tower to the southeast. A massive construction site in the centre of Berlin. Back on Heidestrasse, already you can sense that this main street will become a lively boulevard. Wide, tree-lined pedestrian walkways line both sides of the street, with the lanes now separated by a green strip. To the east – though still just building shells covered in scaffolding – the first buildings are going up on the street, like the office and pharmacy building near the Rieckhallen, and then directly after that, the office building of MY.B. The residential and commercial building of Ditting GmbH & Co. KG is also taking shape. Further north, Europacity starts to thin out noticeably. 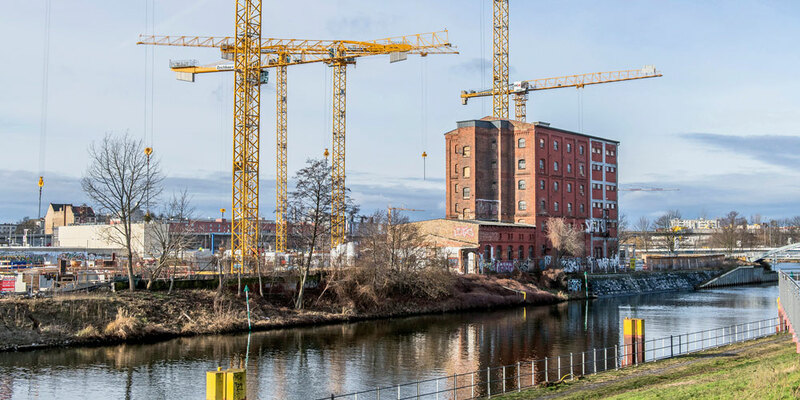 However, here too, right on the banks of the canal, KAURI CAB has started building the residential quarter, Wasserstadt Mitte, on behalf of Adler Real Estate AG. This complex also incorporates the historic grain storage testing facility, which, with its red brick facade, makes a highly visible point of interest. And here, too, life is taking up residence. In the coming months, visual artists from a variety of disciplines will present a number of exhibitions and events here. And with that, an old grain store transforms into a new fixture on the city’s cultural scene. Completed in 1898, the building not only served to supply the population of Berlin, which had grown rapidly around the turn of the century, but also where methods of grain storage were scientifically tested. The property, whose interior was refurbished in 1915 with a then ultra-modern steel skeleton structure, is now a listed building. To incorporate it into the new quarter, KAURI CAB will undertake a renovation of the building starting end of June. The upper floors will be made available for office use, and in accordance with current planning, the ground floor will remain open to the public. On the other side of Heidestrasse you will need a little more imagination. Currently, the scene is just sand, but the first buildings will start taking shape here soon as well. In November last year, construction started on the district Quartier Heidestrasse. Stage one is called QH Core, a mixed use area with a large local conven­ience shopping centre, and the future heart of the district. Where the excavations and bulldozers of today are now, the residents of Europacity will be tomorrow – meeting up for shopping or a stroll, enjoying a lunch break in one of the new restaurants, or sitting at a café taking in the sun. When Eike Becker looks out the window to the west, he looks out at a curious image of Europacity. Almost directly at the base of TOUR TOTAL, on the western edge of Heidestrasse, there is a row of old buildings, behind some of which extend winding commercial estates. For many years, this tiny piece of urbanity was all there was in the empty landscape. The eastern area was a no-man’s-land dominated by the shadow of the Berlin Wall, and to the west only railway tracks. Nevertheless, a colourful and lively mix has developed here. Small manufacturing companies, artist studios, architecture offices, a dance school, and a billiard bar, have all found their home here. With Europacity, these pioneers will now be getting new neighbours and an urban environment. For the small patisserie, Ben & Bellchen, this is a stroke of luck. Last autumn, Isabel and Benjamin Hoffmeier rented a place in 54 Heidestrasse. Since then, they have been watching with interest what is happening in the new quarter. “Every day we see the changes on our doorstep. We are happy when life moves in here and we get new neighbours,” says Benjamin Hoffmeier. Ben & Bellchen produce mainly small pastry goods that can be individually personalised, so-called cake pops on a stick, and colourful cupcakes. In the entrance of the bakery the pink and pastel coloured pastries create an appealing effect on the appetite. Soon there will be a small local shop on-site. 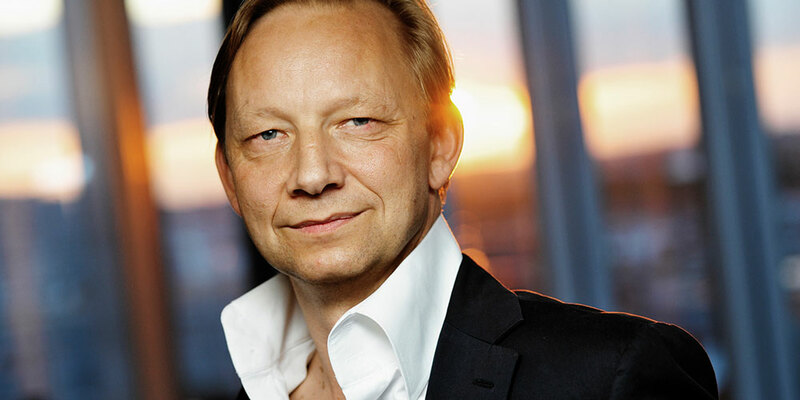 The many companies that will gradually settle in Europacity may one day become customers of Ben & Bellchen – and welcome neighbours for that reason alone. For the move to Europa City, the auditing firm KPMG has introduced a new, flexible office concept. In march, the employees move into the compledted new building on Heidestrasse. Inner city wastelands with great future are surfaces for projecting both hopes and worries. What kind of city can emerge here? The Vision: A Quartier combining Innovation, Ecology and Quality of Life. Katrin Lompscher, Senator for urban development and housing in berlin, talks about the major inner city project europacity. Senate building director Regula Lüscher talks about the plans for Europacity and the role of the state of Berlin in this project.